You know about Dale Carnegie. He is famous for his book How to Win Friends and Influence People. He wrote many books in his lifetime. 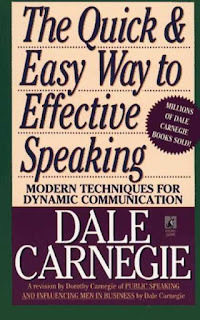 One such book was The Quick and Easy Way to Effective Speaking. I picked it up from my bookshelf one night. My main interest was to know how relevant is Dale Carnegie in today's PowerPoint age. He taught public speaking way back in 1940s but is he relevant today? What does his book have to offer to you and me? Well I skimmed through the book and loved what I read. I am going to summarise some things which I liked and I feel will help you become better at presentations and public speaking. This is not a book review but captures some of the learnings from the book. Dale Carnegie stresses on the point that you have to 'earn the right to talk'. Hence, you need to know about your subject inside out and be really excited about sharing it with others. If you have earned it, people will listen to you. While preparing for your presentation, he insists to talk about very few things and know everything about it rather than talk on many things and be superficial. A superficial talk cannot hold audience attention. You can also get audience attention, if you can answer this simple question. "How will your presentation solve your audience's problems?" If your presentation is able to solve their problem then they will listen to you. I liked this part of the book very much. We all know and we all share examples in our presentations. Examples to explain a point we are trying to make. Dale Carnegie tells you how to give an example. c. Use pictures or speak in a vivid manner so that the audience can 'see' what you are talking about. For example, when you talk about global warming put up a picture of a melting iceberg. That will make your audience to really 'see' the problem and appreciate it better. d. Make it real by using direct speech. While narrating an incident where two people are talking, use dialogs and don't use indirect speech. c. Be specific and say "I have 3 things to say..." This will help your audience pay attention and follow you. d. Use analogy. Compare strange unknown things to familiar things. e. Help your audience visualize the information by turning a fact into a picture. Instead of saying India's area is XYZ square miles say 'India is equal to the combined area of.... (and say the names of some 5 large countries)'. This will give people a better picture and increase their comprehension. f. Avoid jargon. Always assume you are talking to school children. Keep it that simple. Aristotle once said, "Think as wise men do, but speak as the common people do." Let's accept it. How much ever you might prepare you will always feel you could have done better. It is like an exam where no amount of time seems sufficient for preparation. Amidst this feeling how do you sound convincing to your audience? Dale Carnegie tells you what will it take to convince the audience. d. Get some 'yes-es' at the start. Look for common ground where no one disagrees and start your presentation from there. Then slowly move to areas where people might disagree. The initial yes-es will set the momentum in your favour. I found this book immensely useful and I am sure you will find it useful too. Take out time to read this classic, read it slowly, spend time thinking about each idea and most importantly apply them in the next presentation you make. Test out whatever you learn. That way it will stay with you forever and make you a better presenter. Just reading will do no good. "While preparing for your presentation, he insists to talk about very few things and know everything about it rather than talk on many things and be superficial. A superficial talk cannot hold audience attention." I think that is incredibly important as a presenter. Sometimes presenters feel that the quantity, rather than quality, of their information will have the most effect on audiences. On the contrary, keeping a narrow but deep focus will help audiences learn and retain the information better. When we present we want to share everything with our audience. After all we have done all the hard work. But that does not help matters. Information overload will hide the key messages and overwhelm the audience. I remember what my rector in school use to say, "Eat only 80% of what you can. Don't stuff yourself with more."